A hipster haunt of savory influences at David Chang's LA debut. 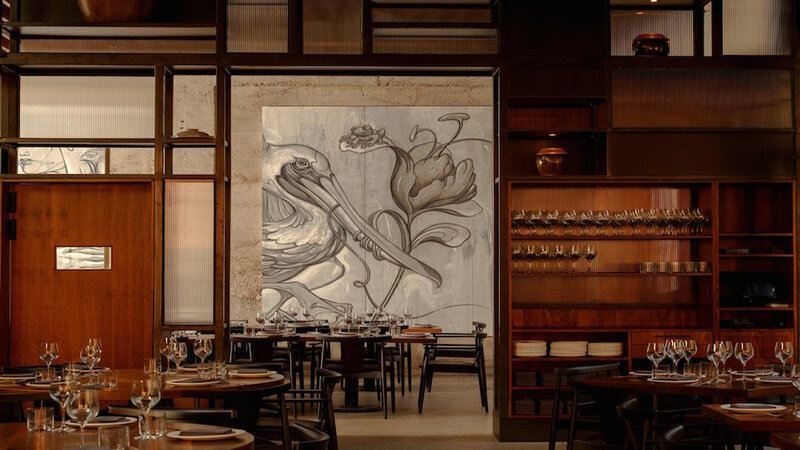 Majordomo is the latest (and first LA restaurant) from accomplished chef-entrepreneur David Chang, of Momofuku Noodle Bar and Netflix's Ugly Delicious fame. This north-of-Chinatown instant classic caters to a sophisticated and buzzy crowd of dedicated foodies and fine dining enthusiasts. The interior vibe is upscale, busy and urban. The former warehouse sports a high ceiling and tall industrial windows that create an illusion of extravagant space, while the rough concrete walls are softened by wood partitions and gorgeously colored fine art canvasses. A pleasant courtyard patio beneath strung lights offers outdoor dining and entertaining. The menu is a tantalizing blend of influences too complex to precisely pin down: Korean, Chinese, Italian, Japanese, French, Southern-American and more flavors and techniques. A signature dish is gochu jeon, Korean green chiles packed with smoky sock sausage and pan fried. Spicy lamb bing, crispy pork belly and succulent and tangy short rib raclette hint at the wide range of possibilities in store for adventurous diners. Bartenders are highly trained and experienced, with a full range of ingredients for artisanal cocktail experimentation at their fingertips. A select wine and beer list is also available. Reservations are available 30 days in advance and often book in seconds; bar seating is available for those not afraid to wait. Vespertine is event dining that caters to pricey tastes in LA.